Our product range includes a wide range of airnergy professional plus oxygen therapy. For commercial institutions and demanding home users. The AIRNERGY Professional Plus is designed with four activation units, sophisticated extra features and extra power for demanding continuous use. The device is ideal for intensive commercial use. The guarantee period is 2 years. After about 2,000 hours (about 6,000 applications corresponding to) a "Service2000" is recommended. For medical and industrial institutions as well as for the demanding home users to Spirovitalisation - with integrated color therapy (blue). ... for the prevention, regeneration, quality of sleep, daily energy, well-being and relaxation. 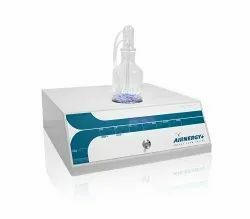 The AIRNERGY device in the version "Professional Plus" is designed with four Airnergy activation units, sophisticated additional functions and for demanding continuous use. The Professional Plus is the desired by the customers most frequently device. It is easy to use (delegated), virtually maintenance-free and ideal for intensive use in medical practice or clinic, commercial device, for example for company health care, and for the most demanding home users. The scope of delivery includes all accessories for immediate use. In addition to the power supply (100-240V AC / 50-60 Hz)), the bubble element with hoses and adapters, the water bottle, you will receive an initial supply of consumables of 20 respiratory eyeglasses as well as 2 air and bacteria filter included. For this purpose a sample of nasal cannula pocket for storage of the nasal cannula in use in each case. A special care of the equipment is not necessary. In addition to the regular alternation of the low-cost air filter (2 pieces included) after every 50 hours of operation (about 150 applications) there are no costs. The guarantee period is 24 months and can be extended to 36 months. All Airnergy devices are manufactured exclusively in our factory in Germany are equipped with quality materials and designed in detail for a high life expectancy. The Airnergy AG is a manufacturer of medical devices according to DIN EN ISO 13485: 2008 and the environmental standard DIN EN ISO 14001 (Ökozert): 2010 and according to the quality management standard DIN EN ISO 9001 certified. After about 2,000 hours (about 6,000 applications corresponding to) a "Service2000" is recommended. The life expectancy of the Professional Plus is designed for more than 10 years. The operating costs are low. The Professional Plus has, for otherwise identical design as a medical "Medical Plus" with only one power level (100%), three power levels: 50%, 75% and 100%.